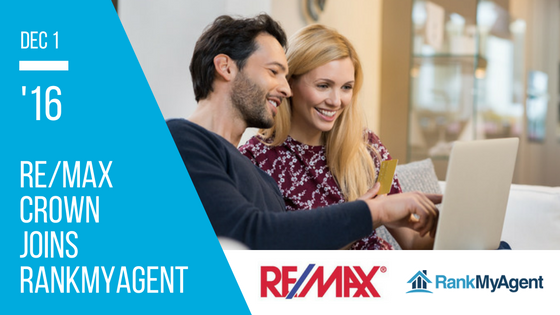 Regina, Saskatchewan (December 1, 2016) – RankMyAgent.com is thrilled to welcome RE/MAX Crown Real Estate to its comprehensive online review platform that connects real estate professionals to consumers. The deal provides RE/MAX CROWN comprised of two RE/MAX offices in Regina, premium access to the platform’s tools, including RankMyAgent’s suite of reputation management and broker tools. “Our sales associates look after their clients’ needs very well and we credit our success because of the outstanding work they do. RankMyAgent was a natural fit for us as it was a great way to reinforce our positive reputation locally.” says Broker Owner Rob Nisbett. All Agents from the office will be given RankMyAgent premium accounts that they can use to send customer survey invitations on closed transaction. The partnership allows RE/MAX Crown agents to engage with existing clients, build, monitor and monetize their online presence – an asset becoming increasingly important in today’s digital-driven marketplace. RankMyAgent is a Canadian online platform that connects Real Estate Professionals and Brokers to consumers by using the power of reviews to get them recognized, generate leads, and build their online reputation. Since it’s inception in 2014, RankMyAgent is comprised of thousands of agents Canada wide and it’s helped consumers make the agent selection process efficient, trustworthy and successful. RankMyAgent is on a strong growth trajectory with partnerships with RE/MAX of Western Canada and RE/MAX INTEGRA and Lone Wolf Real Estate Technologies. To learn more, please visit https://rankmyagent.com.